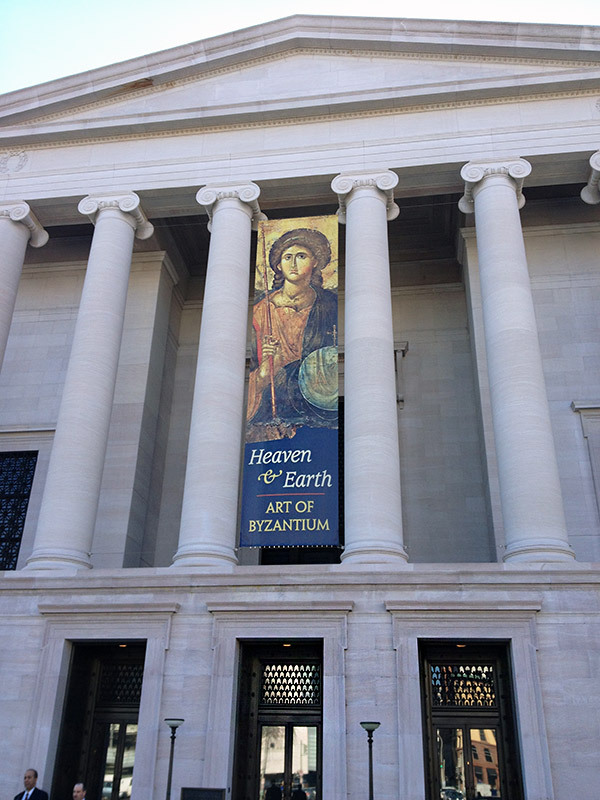 Exhibition banner for Heaven and Earth flying high at the National Gallery of Art, Washington D.C.
Movies have directors; museums have curators. In planning an exhibition, curators control the final picture, dramatically shaping what a visitor experiences. 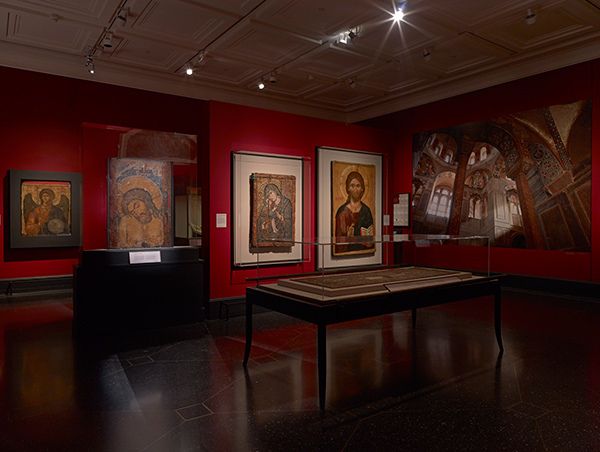 The exhibition Heaven and Earth: Art of Byzantium from Greek Collections was “directed” by two American curators, Susan Arensberg and Mary Louise Hart, in partnership with Greek curators from the Hellenic Ministry of Culture and Sports and the Benaki Museum in Athens. Susan and Mary have interacted with these objects as few others have done, getting the chance to study them in great detail. I wanted to know which of the over 150 objects in the exhibition these curators found the most interesting and magical—and they shared their selections with me. 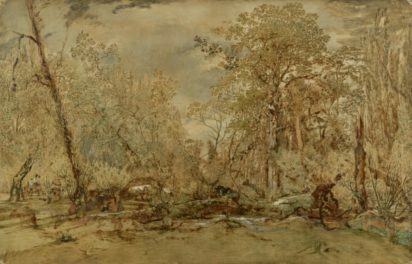 Susan Arensberg, who curated the presentation of Heaven and Earth at the National Gallery in Washington, D.C. (October 6, 2013–March 2, 2014), chose three objects as particular favorites. All are ones that, with close looking, reveal more than first meets the eye. Less than a dozen large mosaic icons survive, so this is a great rarity. The mosaic technique was known in antiquity but reached its height in Byzantium. Byzantine mosaics are much subtler in technique and make use of small cubes, or tesserae made of marble, mother-of-pearl, colored glass, and gold and silver leaf. Byzantine mosaicists used such materials to create figural compositions of great complexity and expressive power. They often inserted irregularly sized tesserae, especially those of gold and silver, at different angles to catch and reflect the light to create a sparkling, otherworldly atmosphere. 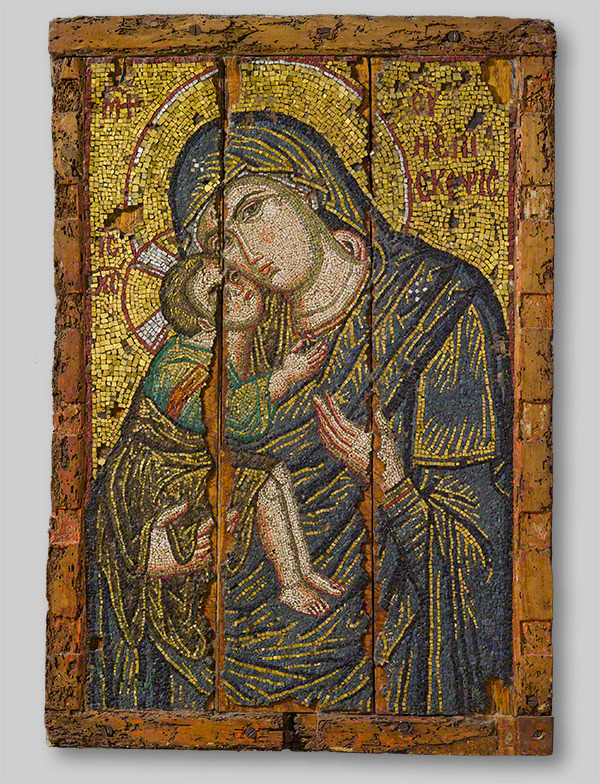 In this icon, the artist used the largest tesserae for the background, smaller ones for the drapery shot with golden highlights, and still smaller tesserae for the flesh tones. With tiny marble chips in shades of ivory, cream, and pink, he created the Virgin’s tender, rather melancholy expression, suggesting that she foresees the fate of her son. Susan also pointed out another particularly fascinating work: the small golden pectoral cross of Georgios Varangopoulos, which was worn around the neck. Its front is adorned with lapis lazuli, possibly imported from Afghanistan, the major source for that stone. 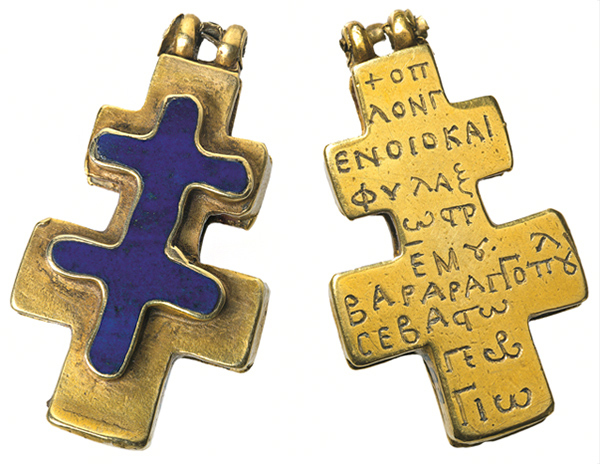 The cross is unusual, Susan pointed out, because it is inscribed with the owner’s name: the back bears an inscription stating that it was made for Georgios Varangopoulos. Mary Louise Hart, curator of the presentation of Heaven and Earth at the Getty Villa, pointed out several more objects worthy of a special look—in particular this liturgical cloth, which she named as a personal favorite. What stands out most is the extraordinary expression of emotion the embroiderers were able to achieve with needle and thread—typically a medium that presents forms more stiffly. This is even more pronounced with the inclusion of gold and silver wire wrapped around the silk thread. The expression of human emotion carries the religious content and meaning. And the variety of angels, of course, is fabulous. There is drama within this cloth, and drama surrounding it: this cloth is located in what is arguably the most potent religious and emotional space in the exhibition, between the Palaeologan Crucifixion, the icon of the Pantokrator from St. Sophia in Thessaloniki, the Virgin Episkepsis from Constantinople, and the Man of Sorrows from Kastoria. Many themes can be articulated through this core arrangement: Palaeologan iconography, the art of Thessaloniki, mosaics compared to icons, Orthodox iconography. The Thessaloniki Epitaphios (foreground, in case) anchors a dynamic arrangement of Byzantine icons in the exhibition. Textiles have often been overshadowed by other art forms that have survived the centuries in better condition and in higher numbers. 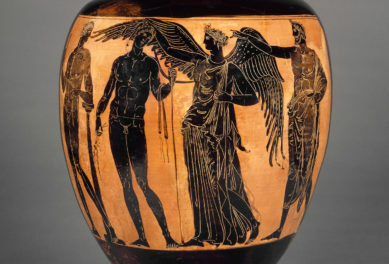 Recent scholarship and exhibitions are effectively closing that gap, but few examples are left from antiquity, making this one all the more significant. When the Getty team unpacked the Byzantine liturgical cloth, Mary said, they were all amazed by the detailed embroidery. In the Getty Villa exhibition, the red wall color brings out the gold and red colors even more intensely. Don’t miss it, or the glittering selections Susan named, when you visit the exhibition. 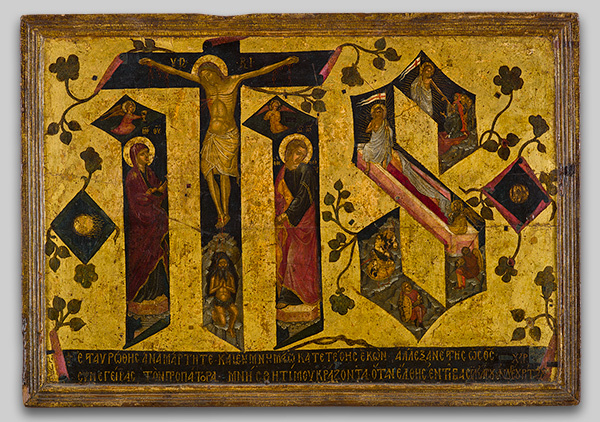 What is your favorite artwork from the exhibition Heaven and Earth: Art of Byzantium from Greek Collections? Thanks to Mary Louise Hart and Susan Arensberg for their time in answering my questions. Mary is associate curator of antiquities at the J. Paul Getty Museum and a specialist in ancient myth, epic, and theater. Susan is head of the Department of Exhibition Programs at the National Gallery of Art in Washington, D.C. Text of this post © Ashton Prigge. All rights reserved. 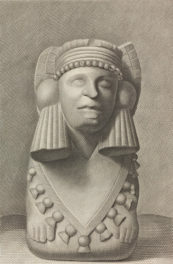 I'm a second-year undergraduate student at UCLA currently studying art history. After taking Professor Sharon Gerstel’s Byzantine art seminar, I have been completely captivated by the power and splendor of the Byzantine Empire. Outside of academia, I adore my morning coffee and a leisurely brunch. My favorite is the Fragment of a Wall Mosaic from the Church of Archairopoietros in Thessaloniki. The blue and green acanthus leaves float above a fountain that seems to be spilling over onto the earth and the the viewer gets a special treat if they crouch down in front of it and see the SPARKLING gold background. One feels transported to the Basilica in AD 450, marveling at this heavenly creation, dazzled by the artistry and contemplating what it meant to the people of Thessaloniki at that time.